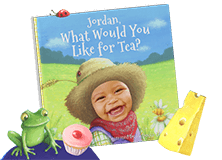 Select an award-winning personalized children's book your child will love. “My son absolutely LOVES seeing his face throughout the book." What Would You Like For Tea? Colorful friends with the most peculiar appetites are coming for tea. What will your child offer them to eat? 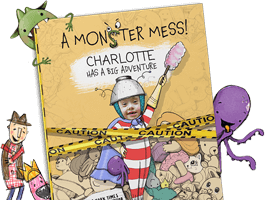 Who…or what created a monstrous mess? Follow the clues along with your favorite kid to discover who almost made a clean getaway! A unique and timeless way to celebrate a precious moment in time. This illustration of your newborn is scaled 1:1 to your baby's length at the time of birth, and is personalized with your child's name and birth information. 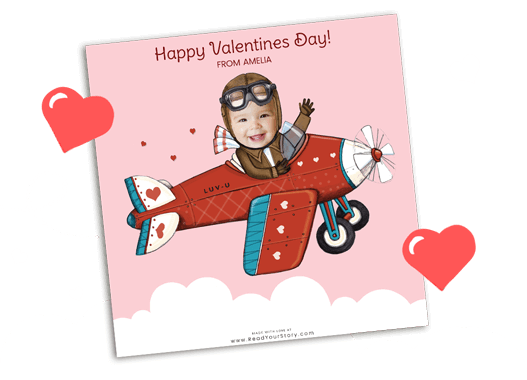 Send love on Valentine's Day with this free eCard, personalized with your child's name and photo. Choose from 3 colors. 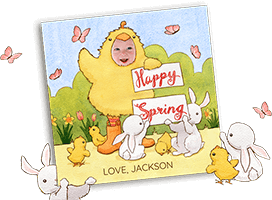 Wish your friends and family a happy spring with this free eCard, personalized with your child's name and photo. Bring a smile to your mom's face on Mother's Day with this free eCard, personalized with your child's name and photo. 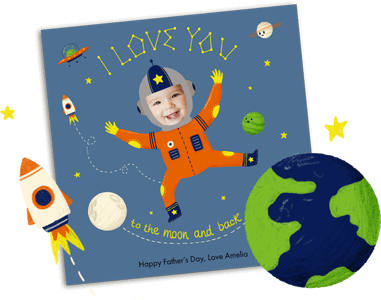 Wish your dad the best day ever with this free Father’s Day eCard, personalized with your child’s name and photo. Say "BOO!" 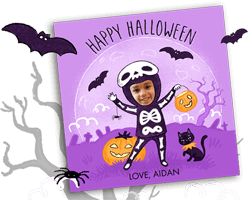 with this free Halloween eCard, personalized with your child's name and photo. Discover the most personalized children's books, ever! 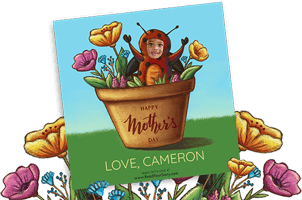 At Read Your Story, we create made-to-order books that are uniquely personalized to your child, meaning they feature your child's name and face throughout the story! Imagine the delight your child will feel when they see a book, made especially for them! Our books also offer other special personalized touches, such as a free dedication that you can include at the end of your book. Additionally, some book titles offer the opportunity to include family photos which your child will see when they are reading their story. 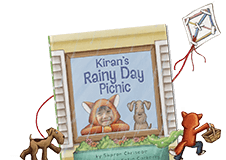 We work solely with vetted (and in many instances, award-winning) children's book authors and illustrators to ensure that we are able to produce engaging, high caliber, personalized children's stories. Our customized books are also the recipients of several awards, such as the Mom's Gold Choice Award®. We print our books using the highest quality materials, such as PUR glue—a strong and flexible binding agent, perfect for children's books!—and thick, archival-quality Mohawk paper so that your pages won't fade over time. 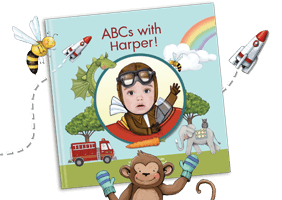 Order a personalized children's book with confidence. Create a book with just a name and a photo, and preview the entire book for free, before you purchase. Once we receive an order, it goes through two manual touch points to ensure the photo is meticulously placed in the book and that there are no spelling errors in the dedication. We strive for perfection to make sure every customer is 100% satisfied with their book. We're Donna and Jeanette, two moms on a mission to create the most personalized children's books, ever! The idea for a personalized book came to Jeanette when she discovered her fascinated one and a half year old daughter perusing a book of pictures, filled with people whom she didn't know. Jeanette had an "ah ha" moment and thought children's books could be much more engaging if they were filled with photos of someone her daughter recognized—herself! And so, the idea for a personalized children's book, featuring the child's name and face throughout, came to be born. We warmly welcome you to Read Your Story and encourage you to browse through our selection of personalized books. Create magic today and make a personalized book in just a few clicks! Be the first to hear about subscriber-exclusive sales, new books, contests and more! Do you write or illustrate? 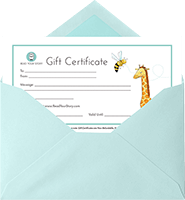 Refer 3 friends & get a FREE softcover gift certificate. Join our program and earn a 10% commission. 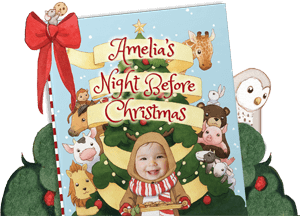 10% of the retail sale price for every book sold through Dec. 15 will be donated to Project Night Night. Learn More.